We signed with SUBURBAN NOIZE RECORDS! I am very proud to announce the alliance between Swollen Members and Suburban Noize Records, I know our listeners and the wide audience of the SubNoize world will unite to form an unstoppable force. We had a gig in San Bernardino for the 15th Year Anniversary of the label, and it was a seriously dope crowd. We had the pleasure of playing with Big B, Hed-PE, Hollywood Undead, Tech-Nine and Kottonmouth Kings. Being welcomed into the SubNoize camp is an amazing hook up, it will open many doors for us and exponentially increase our opportunities in the States and around the world. You, our dedicated appreciators, have waited long enough, it is time for new music and a re-concentrated effort as far as getting exposure. The pages of our history are yet to be filled, our true legacy still to unfold. To those who have stood by us for years, to those who are newcomers to the Swollen Members movement, one common bond unites us, pride. The knowledge and belief that being true to yourself is the key to happiness in life, this understanding is the platform that gives us the strength to create and not be afraid of being different. Collectively our voices will be heard, but with Swollen, as it is at Suburban Noize, it's a family affair, and we are thankful to have the chance to welcome new members at every chance we get. The future is ours for the taking! I will hit you again soon, until then, stay safe and have fun. Looking forward to future Swollen Members releases with Suburban Noize. 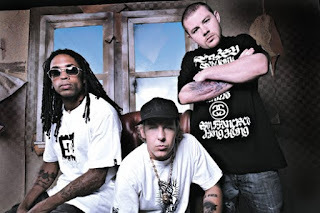 Who will the Kottonmouth Kings sign next? Check out some videos below. Stay with SykoNews for updates on Swollen Members and Suburban Noize Records. Subscribe to our RSS feed or follow us on twitter!